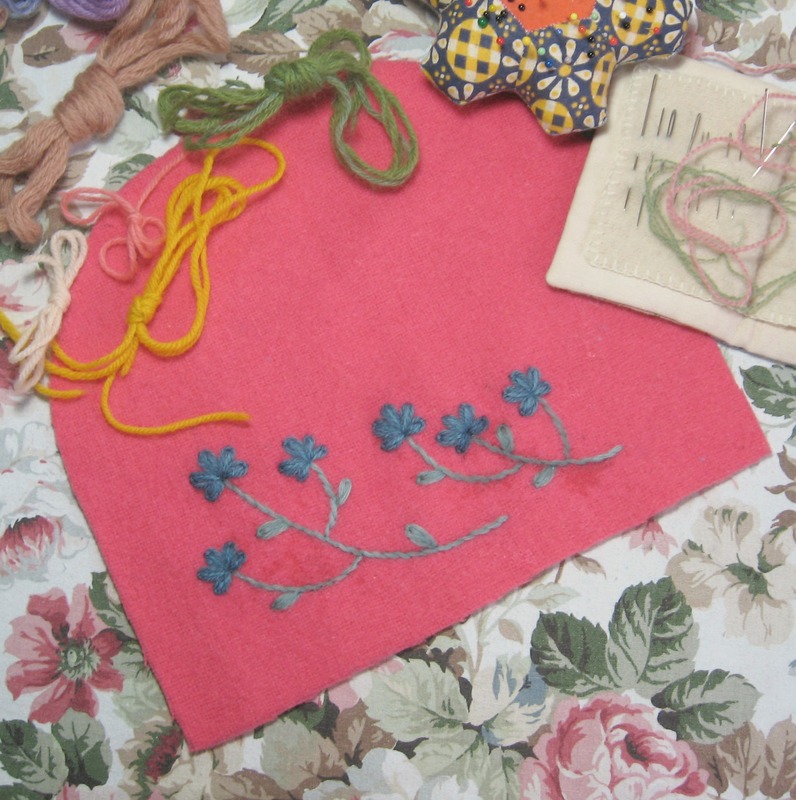 Woolly flowered embroideries and getting lost in the ancient world…….. 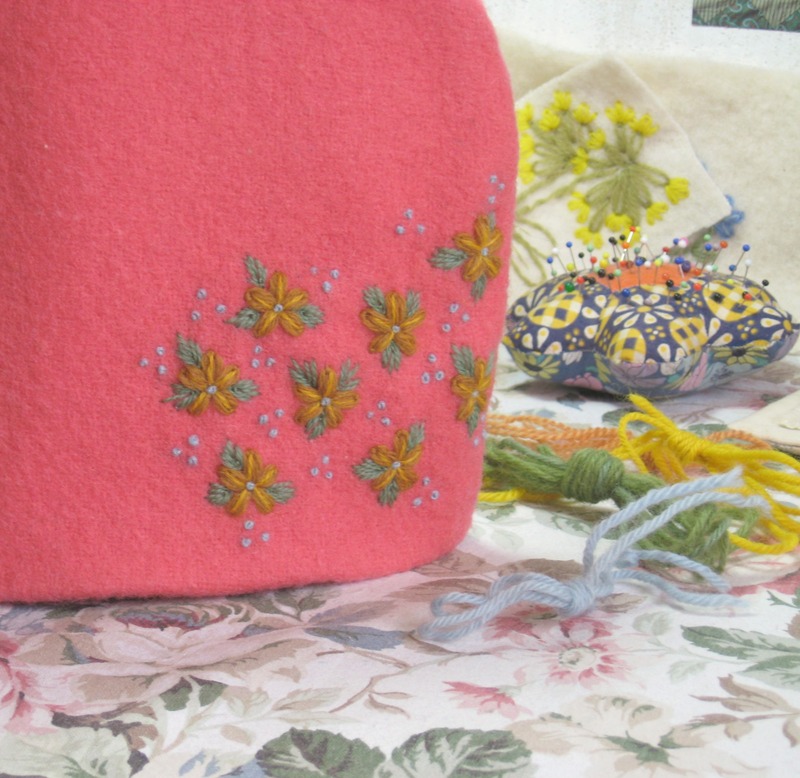 While it’s been somewhat nippy outsdoors I’ve stayed inside with a pot of tea never far away and a pile of tapestry and crewel wools beside me while I continue with more embroidering on wool fabric, I’ve been repeating the forget-me-not-esque motif I’d sewn on the bunny along the front of a cafetiere cosy. I’d already embroidered some hot water bottles before Christmas but haven’t had a chance to sew up the sides and sew in the linings though they are on one of the many to do lists that I have pinned up in front of me. I’ve used an aptly named stem stitch this time for the stem and then it’s lazy daisy’s for the petals and leaves with an extra stitch in the middle to fill in the gap. The wool used is lovely Penelope tapestry wool, it’s so soft and the colours are really gentle. 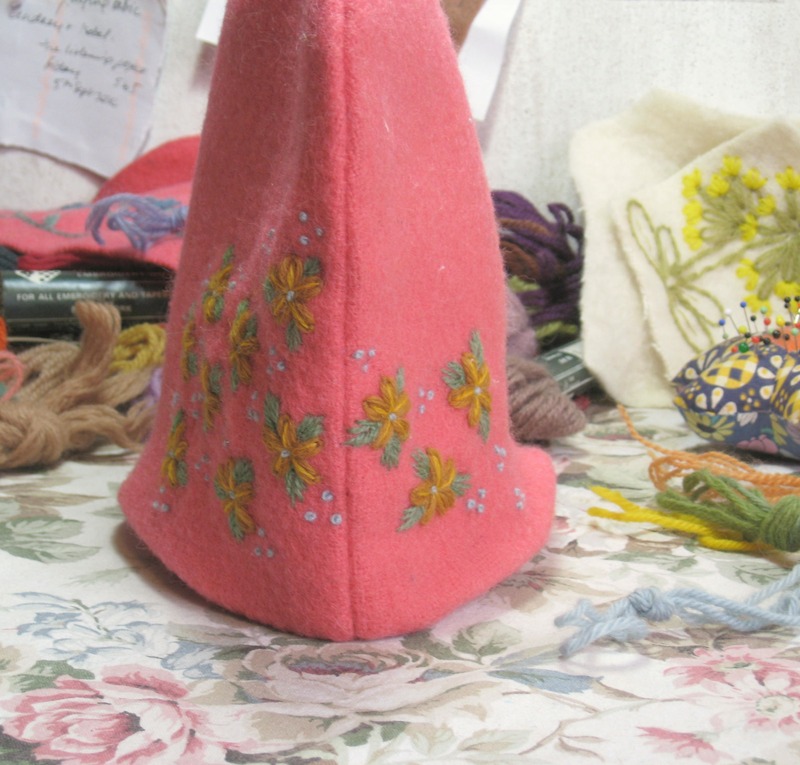 It’s slightly thinner than today’s tapestry wool and is my favourite wool for embroidering. I’m really pleased with how this motif has come out, it’s nice and simple to do, not too fiddly and although it takes a little practise to get the lazy daisy’s just right, once you get the hang then they almost make themselves. I mentioned the other day that my friend Ruth who has Glory Days in Holt has asked me if I’d be interested in running a workshop once she has moved to a larger premises and I’m thinking I’d quite like to incorporate some wool embroidery in what I make……I don’t have a car so I’m thinking machine sewing (ugh ugh ugh……okay, I do do some sewing on a machine, I’d have the devil of a time trying to sew my Christmas stockings and hot water bottle cosy’s without my Bernina and it’s walking foot, but I don’t get the same pleasure as when I snip some cotton, thread up a needle and sew by hand) is out the window as I can’t really be lugging about a big machine on the bus, but a basket of wool and embroidering needles is much more manageable. 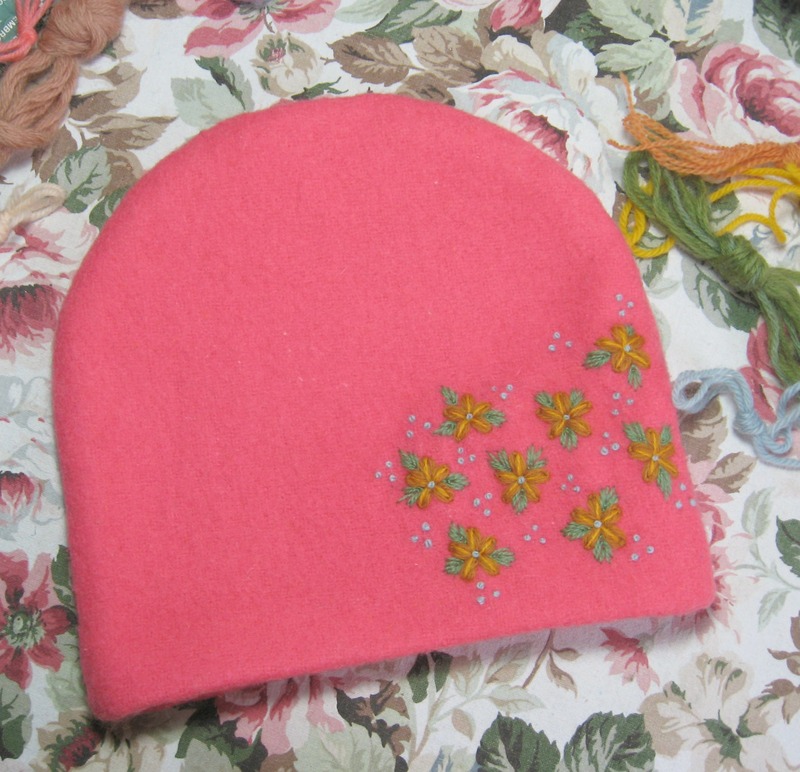 I’ve continued the pattern around the side so it gently tapers off at the back. 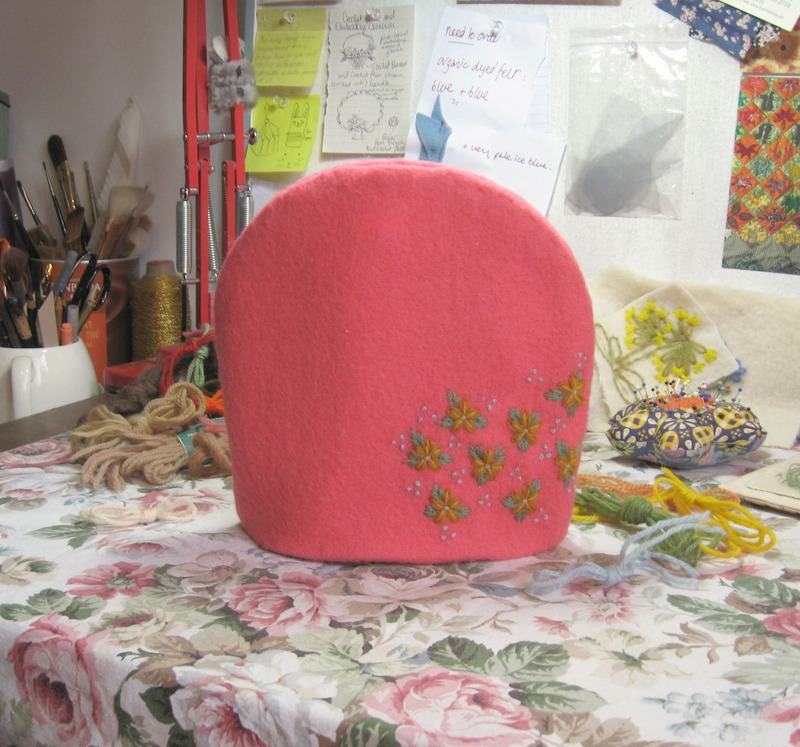 As these cosies are made a little different from when I’ve made them in the past (the bottoms tuck up and in, then lining is slip stitched in to place…..when I’ve made them prevously I’ve sewn lining, wadding and cover together and then covered the hem in binding) I thought the back would look a bit drab if I didn’t add a little point of interest. I’m hoping to get these all finished in the next day or so, the weather has been a bit too breezy and wet to lure me out for a walk, so pots of tea, wool embroidery and listening to John Romer* are my plans for the day. *In case you don’t know who he is, John Romer is probably one of the most well known television presenter of ancient history in the UK. He’s fantastically interesting to listen to and his enthusiasm is a real joy to watch, but it’s been some years since he had a series on television. His series Seven Wonders of The Ancient World is still available to purchase (it’s a real treat, he really brings you in to the history and myth of these statues and buildings) but if you don’t want to buy it you could try at your local library to see if they can get it for you. However the other series are really hard to find but I discovered recently if you look on You tube then a lot of them are on there. His Seven Wonders will always be my favourite, he looks so happy as he is describing the absolute wonder and importance of archaeological finds…oh I just love him to bits. But also good is his Ancient Lives series (he’s look all young and rosy cheeked in that one), and his series Byzantium. I think there are 7 documentary films by him in all and they are all totally captivating, I admit I do look up a fair bit while he’s talking as it’s lovely to see him beam as he describes life in ancient cities, or the tools used to make the statue of Zeus at Olympia and the lost techniques used to make it. His books are also fascinating to read, I’m not a scholar but they are very readable, he really makes the past come alive and his enthusiasm and love for his subject is highly infectious. I’m totally not fussed by Hollywood heart-throbs but I know if I ever got to meet John Romer then I’d be all giggles and pink cheeks and completely lost for words. One of my favourite blogs to read is the one Ann Wood writes, she’s an American artist and I’ve loved her work for a few years now…I first heard about her in a pod cast by Paul Overton (his site Dude Craft is just amazing and it’s where I first came across the work of workbyknight. His granny square collection is just mind-blowingly brilliant, because I’m not very technical I thought at first these really were all crocheted up, for real, however it is in fact all on the computer which makes it no less awesome, just less cuddly….the cat pictures are my favourite as is the one of Dame Edna Everage….have a look, they truly are stunning…..oh, you need to click on the image a couple of times to get the full fantastic granny squares crochet effect)…. Anyway Ann Wood’s latest post (feb 5th 2015) is really good, I’m sure the time squandering she writes about is familiar to anyone who works at home, it’s making me think I need to do the same sort of thing as hours seem to disappear all the time. And if you enjoy reading that you might like to pop over to While she naps where Abby Glassenberg interviews Ann for a podcast…….have listened to it now a couple of times, it’s brilliant. There is also a section on her site where you can buy her patterns, these are just the nicest patterns with clear and well written instructions, and easy to follow illustrations…her little bird pattern is a particular favourite. The patterns are downloadable and are brilliant value for money.